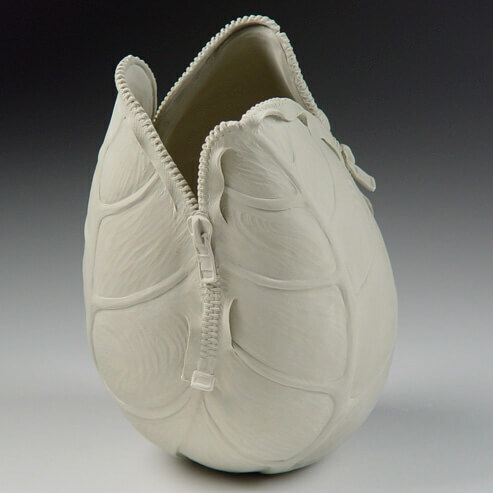 Julie Anderson is a sculptural ceramic artist and art instructor living in Steamboat Springs, Colorado. Her work is strongly influenced by the mountain environment as well as her science background in biology. She incorporates botany, hydrology, chemistry, ecology and environmental issues into intricately carved hand-built and wheel-thrown forms. Anderson’s sculptures have recently been included in several exhibitions such as the 2011 Plinth Gallery/Anderson Ranch Exhibition: A Ceramic Collaboration and NCECA’s 2009 Contintental Divide at the Arvada Center. With a background in biology, images of science and nature are consistently present in my work. Many of my forms are broken down into detailed parts that illustrate the “building blocks” of a given subject within nature. Cells, molecules and eddies of water adorn portions of my sculptures. Buttons, zippers, screws and various types of man-made hardware are often incorporated into these organic forms, alluding to man’s manipulation of nature. Issues of climate change, genetic modification and the excessive use of natural resources are a few of the concepts that I explore through my sculptural work. I see working with clay as a dance with nature. For me, there is no other medium or mineral that comes so close to being alive and human-like in its characteristics. There are many metaphors in ceramics that support this observation. We awaken the clay by wedging. We are aware of the clay’s memory when manipulating fine-grained porcelain. Dry clay breaths and expands as is absorbs water. It goes through metamorphosis, aging over time in a heavy plastic bag or maturing as we subject it to heat and energy. These characteristics are exactly what keep me on my toes and thoroughly engage my subconscious as I create with this highly responsive material.